One thousand feet above Washington's Columbia Valley, the highest reaches of dusty Snipes Mountain lie beneath river stones, vineyards staked incongrously in a mix of arid earth and the water-rounded rocks of gemlike beauty and crayon-color variation that winegrowers here call cobblestones. Less than than seven inches of rain fall on them every year. Among the more than 30 wine grape varieties grown: small amounts of Italian grapes like Barbera. Much of the land that makes up Washington's AVAs — the United States's official agricultural zones, loose counterparts to Italy's DOPs and France's AOPs — is desert: all but one are set in the state's eastern side which is cut off from urban Seattle and Pacific Ocean rainclouds by the Cascades mountain range. Beneath them all, three jostling tectonic plates: the Pacific, the North American, and local troublemaker Juan de Fuca. Many of the arid plains and hills here once lay smooth and fertile under water. Then the land buckled and folded, forming hills, ridges, outright mountains, the lower parts washed over by Ice Age floods, were dried by wind and sun and time, were washed again. In the summer the sun can be relentless here but nighttime temperatures rush in to cool the day's heat. More than 300 grape varieties grow, sucessfully. A steadfast number of them are Italian natives, turned to wines that reflect their original lands as much as these new places. Like its land formation, Washington's winemaking is a story of stops and starts. "Grape growing in Washington began during the 1860s in the Walla Walla Valley and a decade later in the Puget Sound," writes Leon D. Adams in the 1985 edition of The Wines of America. Grapegrowing in Washington began no later than the 1920s, reports Andy Perdue on Ron Irvine and Walter Clore's Washington-wine-focused The Wine Project. "The earliest record of Washington wine production is of a winery operated by Frank Orselli, from Lucca in Italy, near Walla Walla in 1876," notes Adams. Then the blow of Prohibition, and the frenzy of Repeal. It took until the 1980s for serious winemaking to take hold here, but the roots run deep now: today there are more than 900 wineries in Washington and more than 300 wine grape varieties grown. Syrah, Merlot, Cabernet Sauvignon and Riesling are prominent, but more than a few people hold strong to grapes native to Italy, some in tribute to their ancestors among the state's first winegrowers, others who simply find these vines flourish winewise when well-matched to Washington's terroirs. There are "three fundamental things to think about the land here," geologist Kevin Pogue explained when I visited the state this spring. First, the unifying factor is basalt, the flow of a volcanic eruption 15 million years ago. A sheet of that black volcanic rock stretches across much of the area, so heavy it has dented the Earth's surface. Then, altitude: "In the Columbia basin, land that lies below 1,200 feet is affected by the Missoula floods" — over 5,000 years, during the last advance of the Ice Age, waters rushed here from Montana at "sixty times the volume of the Amazon River," Pogue illustrates. "Floods that released as much as ten times the combined flow of all modern rivers worldwide in a single event," scales John Szabo, MS in his Volcanic Wines: Salt, Grit and Power. These fresh waters swept over the Columbia Valley, draining, reflooding, draining, reflooding up to 50 times before ending about 10,000 years ago. Then rainfall, which can range from single digits to almost 50 inches across the state's growing zones. "A huge part gets less than 10 inches of rain a year, the definition of desert," Pogue says of eastern Washington. The sediment brought in then left behind by the Missoula waters soon dried up to dusty loess, made mostly of silt derived from granite, with lots of quartz ("There's no quartz in basalt," Pogue clarifies on where the silt didn't come from), and winds from Washington's several major air exchange valleys here carried it away, depositing near and far and often covering those basalt bases — in some Walla Walla vineyards it lies 60 to 120 feet thick, overlaid by a little bit of topsoil. Today, lone granite boulders sit in unmovable imitations of the tumbleweeds that also settle among the vines here, relics of those racing waters. River stones pop up often. There is no humidity or haze. Volcanic, silt-y, made of mostly rock, some of Washington's soils, with further help from cold winter and nighttime air, are inhospitable to the vinifera-eradicting phylloxera louse and lots of the state's grapevines grow on their own roots. Surface materials can change quickly just a few minutes apart. Not far from dusty irrigated sites — "Silt is almost the ideal medium for irrigated agriculture. It's sort of like filter paper, it allows water to just move at a slow pace," says Pogue — other vineyards naturally capture enough water to be dry-farmed. In the early 1980s, Wine & Spirits magazine named a Cabernet Sauvignon made in Washington as the nation's best take on the grape. It had been made by Walla Walla machinist Gary Figgins, in his 1,500-gallon Leonetti Cellar named in honor of his Italian grandfather and, stateside, his uncle Fred. Today Leonetti wines are in the hands of Gary's son Chris, who grows Sangiovese as a tribute to Italian heritage in general and southern Italy's Aglianico because his family is from Calabria. "I probably drink more Sangiovese at home than anything," Chris says. On the Washington State Wine website: The state's "grape growing began in the Walla Walla Valley in the 1850s by Italian immigrants." The landscape must have reminded them of something, I say to Figgins and Woodward Canyon founder Rick Small — who with his wife, Darcy, wrote the AVA petition that made Walla Walla official in 1984— and who grows Dolcetto and Barbera, too. "It was the trees," Small says after a minute's thought. Washington's locust trees that grow also in Piemonte, eastern-U.S. natives brought to Italy in the mid-17th century, likely through France. The state's Walla Walla onion is an Italian native: a sweet variety brought from the French-owned Italian island of Corsica that then found another, perfect, expression here. Italian grapevine varieties pop up almost quietly in some spots. In 1972, Jim Holmes bought what would become the first vineyard plot in Red Mountain (neither red nor mountain, the refrain here goes), the hottest and driest of Washington’s AVAs — the extreme lack of non-rock material in the soils here leads to smaller berries and accordingly a specific tannic profile in the wines grown here, he explains — because it was cheap. He might, he thought, build a shopping center there. With no water (annual rainfall tops out at eight inches) or access — “I found one arrowhead the whole time I’ve been here,” he says of the lack of people there before him — in the end he built a vineyard. “We did it because we thought it could be fun.” From about three-quarters of a mile away, the Yakima River supplies what water he needs. When those floods came tearing across eastern Washington, "200 ft high, 60 miles an hour, depositing granite boulders here and there," Holmes describes, portions of the resulting loess settled differently from the way they did in Walla Walla. Instead of building up slowly, locally, some dissipated in places that were further away. He crumbles a bit of the Red Mountain soil, and lets it go. Collapsed immediately to dust, it blows away before it can reach ground. It has tiny bits of mica from the Rocky mountains, Holmes says. Even wet it barely clumps together: for well-drained lands that can still hold a touch of moisture. “Same history but a location difference” Holmes says of Red Mountain's relation to Walla Walla. Its Cabernet Sauvignon to the latter's Syrah. Here, Tuscan superpower Marchesi Antinori has partnered with Washington's Chateau St. Michelle, long in the business of championing and producing solid examples of Washington wines, to found Col Solare winery, the building itself a swatch of mediterraneanlike coral hues, with big, elegant, concentrated Cabernets, amid the dust-and-shrubby vineyards. Holmes ends his reminiscence with a quiet coda: There is Sangiovese in his vineyards, where he's also planted Nebbiolo — “the wine has turned out terrific” — there are a few rows of Piemontese white Arneis, too. Perhaps, planting in these vinifera-virgin sites, immigrants from the hotter parts of Italy found comforting reminders of the warmth they’d left behind, and were touched by new possibilities: along with runoff and melted snow from the rain-shadowing Cascades, the Columbia and Snake rivers offer a steady source of irrigation, a discreet wetness slicing through the desert here. During my visit, I saw large-scale growers, making wine while selling grapes to others, too. I met with small, estate ventures; with western Washington winemakers relying on fruit from eastern growers. In all three cases, I saw with awe for, care for these lands whose dramatic, intensely varied makeup seems destined for wine grapes varieties' equally assorted expressions. I saw community here, measured by reliably well-made wines, by ties to the land which seem so much older that I have to keep reminding myself that most of today's vineyards were planted well into the 20th century, many in the 21st, more, like the steep and direction-shifting Rocks District in the Milton-Freeman AVA and the rain-exposure-soil-shifting Columbia Gorge AVA, being dug into this very moment. In the cooler Columbia Gorge, "we make Gorge-style wines from grapes that are native to (or typically associated with) Italy," Idiot's Grace director of operations Trevor Hertrich wrote to me. The winery was founded in 2006 — there, he and cellar master Brain McCormick work, as of 2016, 20 acres planted to 26 wine grape varieties, about a quarter of them Italian natives. "We're really interested to hear what the land has to say, what's going to be happy here, what's going to prosper on this site, so we sort of scattered it around [variety-wise] and went searching for failure," Hertrich told me later by phone. "The vines have to prove that they're not happy, if not they stay." Staying: Dolcetto, Barbera, Primitivo — an Italian clone from a local nursery planted on half an acre and growing beside a stateside Zinfandel biotype. Some Falanghina, some Fiano. Bottles of the latter will be released in 2018. Sangiovese — a little of which is coplanted, and cofermented, with Cabernets Franc and Sauvignon. Why Italian varieties? "The longer answer is that all the sites we farm have never had grapes planted on them before so we feel a bit of an obligation, with no legacy, to guide them," says Hertrich. "We have the resources and the patience to nurture these things, to see how they react to the soils and the growing conditions here." As an early ripener, Dolcetto was among the obvious planting choices. Dense soil with high water retention meant that "if nothing else ripens we could still get some Dolcetto," says Hertrich. "It's really fun to grow, it's got attitude, it's got spirit to it." In this land it turn out a light and lively wine — a truer side of Dolcetto for me anyway in its native Piemontese hills as well — while Gorge Barbera is a "dark, brooding" take of that grape's famous sour red fruit; its earthy side shows deeper here. "It will always come through with a little bit of verve," Hertrich notes of this adaptable grape. "Yeah, we could pull these cherry trees and grow Chardonnay, but that's not what the land wants us to do. We don't want to coerce it." Likewise: "We dabbled in Aglianico. Its days are numbered. It doesn't like being here, it ripens late, we lost almost all of it in an early frost about two years ago." The weather and land patterns that make up this AVA are the foundation of an area unique in the United States, "and possibly in the world," Hertrich says. In this transitional zone, a stretch of many exposures and altitudes and scrambled wind-current-twisting corridors: "There's this drying effect as you move east from the Cascades, so you're still getting enough water to farm, and still getting some protection, from both the rain and the hot temperature. There's so much definition and variation in a very compact space." Rainfall in the Gorge runs from single digits to more than 30 inches. Just a handful of miles away, others are growing aromatic grapes, Syrah, Trousseau, Albarinho, in need of cool temperature, at sharply higher altitudes with "more exposure." They "would have difficulties ripening the varieties we grow," Hertrich points out. The first Gorge vine planters arrived in the 1880s. The first wave of today's winegrowers arrived in the 1980s, and headed for the north-south-running valley there, to the "orchard lands, to the alluvial, silty stuff and small hills that run alongside the gorge, where it was less of a risk to plant grapes for the first time," Hertrich told me, Risk-adverse farmers could and did plant reliable performers on both land and market, Merlot, Chardonnay. Whereas vast stretches of rowed vines make up AVAs like long-gentle-hilled, hot Horse Heaven Hills — dominated by Cabernet Sauvignon — small, diverse plots and innumerable grape varieties dot the choppy Gorge. Summer winds, a climate cooler than the Columbia Valley's, mean that plots up against the Cascades can require sub-alpine-style grape growing, and give ripe yet aromatically intense wines in return. Most of this extremely diverse zone, which runs from cool maritime to hot continental climate with elevations hovering at 1,000 feet, can potentially be dry-farmed. "When the next generation came along, we took up shop further east, closer to the river, much more exposed, the more gorge-y part of the gorge," Hertrich says. "Each of us in this second wave was coming from a different place," all experimenting with what it meant to make wine in their own special part of this varied AVA. The shorter answer to Idiot's Grace Italian picks? "Why any varieties? We really want to have a variation of things growing here to tell us what the land does." One night at dinner, someone mentions Friulano — once the Tocai Friulano of Friuli Venezia Giulia and unshakably integral to that Italian region's daily life for centuries — being grown here, too. And just outside the Columbia Gorge, a Zinfandel vineyard that was first planted in 1888. Back in Walla Walla, Gino Cuneo works with Italian varieties only and does odd things to them, twists on winemaking methods that are Italian, too: "Seccopasso" is a blend of Piemontese grapes Barbera and Nebbiolo with Tuscan Sangiovese, all air-dried, appassimento, an ancient winemaking method throughout Italy and today known especially via the Amarone wines of Valpolicella in the Veneto region. "Ripasso" is of course made ripasso style, of the same grapes. Seattle urban winery Eight Bells vinifies Sangiovese grown in the Red Willow vineyard in the Yakima Valley AVA: earthy, tart fruit, licorice, that shyly fading color that lets you know it's true Sangiovese, at almost 15% alcohol by volume it's both powerful and bright, a Washington rendition of Italian traits. 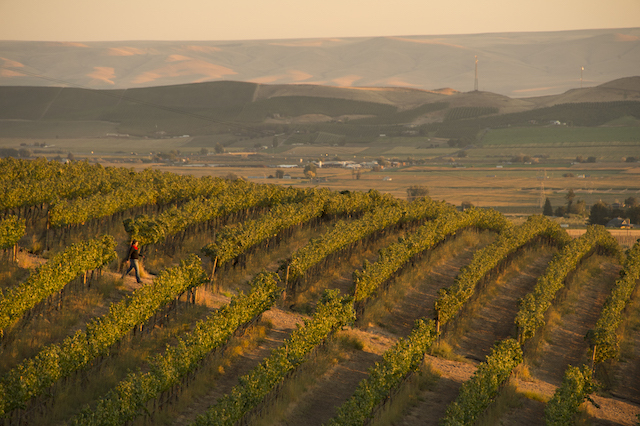 The wines of Washington are in a state of growth and discovery. Some new best zones are being planted just now, varieties being matched to diverse soils and climates. And like their nineteenth-century forbearers, some growers are finding Italian grapes work a different kind of magic here while speaking reliably, gracefully of their native land. I'm looking for more reasons I can't help but see that Italian sense of timelessness and of tightly defined place, here. There is "this strong sense of factionality, you're not Italian, you're Tuscan, you're Piemontese," ventures Hertrich on these grapes' land of origin. "It does occur to me that everyone here has a little bit of that provincialism. Where that comes from, I don't know. We're not modeling ourselves after anything, but maybe there's a universality to if you have this connection to the land." Well, it works. Washington's Italians tend to run a little warm but that is a trait that points back to Italy's wines too. Here, they are pointed, simple and powerful; you know you're drinking Italian wine grapes, you know they're grown and made in Washington. And they're delicious.